This year’s Sales Tax Holiday is Aug. 5 – 7. 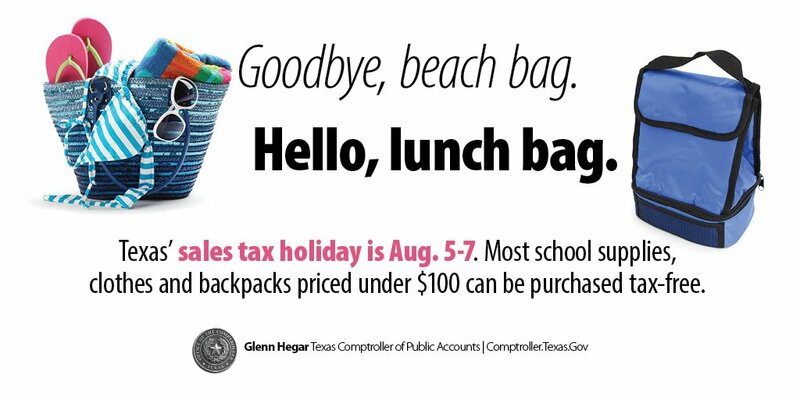 As in previous years, the law exempts most clothing, footwear, school supplies and backpacks priced less than $100 from sales and use taxes, which could save shoppers about $8 on every $100 they spend. Subject to the criteria explained below, all sales of qualifying items made during the holiday period qualify for the exemption, including items sold online, or by telephone or mail. Shoppers can use layaway plans to take advantage of the sales tax holiday. The Legislature sets the dates for the sales tax holiday. Backpacks priced less than $100 sold for use by elementary and secondary students are exempt during the sales tax holiday. A backpack is a pack with straps one wears on the back. The exemption includes backpacks with wheels, provided they can also be worn on the back like a traditional backpack, and messenger bags. Eligible items that customers purchase during the holiday with use of a rain check qualify for the exemption regardless of when the rain check was issued. However, issuance of a rain check by a seller during the holiday period will not qualify an eligible item for the exemption if the item is actually purchased after the holiday is over even if the rain check is presented at the time of purchase. See Rule 3.365(j). A word of caution: If you sell items that do not qualify for the exemption, you may not advertise or promise that you will pay your customers’ sales tax. You are prohibited from advertising that you will not collect sales tax on items that do not qualify, but you may advertise that tax is included in the sales price of the taxable items that you sell. See Tax Code Section 151.704 for more information. For information on how to report tax on these sales, please visit Reporting Sales Tax on Tax-Free Items.